Time to go to bed…just showers and breezy the rest of the night. Peak gust was only 41 mph at PDX, in the end a weaker storm than the first. It just went too far north. But at least there were fewer power outages. Cold front passing through metro area right now evidenced by line of intense rain on radar and pressure jump. Peak gust at PDX at 8:20pm was 41 mph. That might be the best we’ll get unless some random gust is higher in the next hour or two. Just checking in on the observations at 7pm wondering where the wind is like most of the rest of you! As a result wind probably won’t be any stronger than what we saw yesterday…gusts stay under 50 mph. Whatever we get, it’ll be decreasing after 9pm. Update to the update: Of course right after I posted this (now it’s 7:16pm), I see Astoria got nailed with a strong wind gust around 60 mph just as the cold front passed overhead! That’s the strongest of the day…there is still some life left in this thing. We’ll see what happens in the next 2 hours as the cold front moves inland. Generally the strongest wind occurs with the pressure jump (cold front) with these systems. Storm #2 Update: Stronger Than #1! Get ready for a 2nd round of wind this afternoon; it looks stronger than what we just went through yesterday. 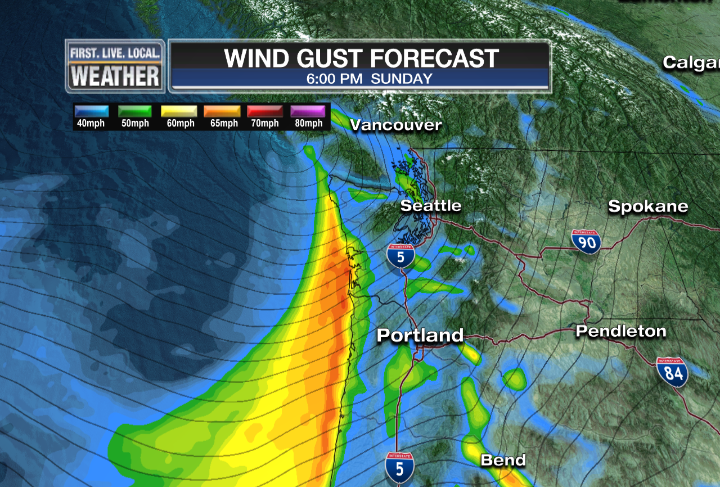 Strong wind develops by 4pm at the Coastline and arrives between 4-6pm here in the western valleys. Peak gusts 45-55 mph here in the valleys, PDX gusted to 43 yesterday. Wind will gradually die down after 8pm. compare that with the 00z WRF-GFS for the same time…almost the same. All 3 show a setup for slightly stronger wind than yesterday, assuming they have the strength and position of the developing low correct. Our RPM even has the center of the low down around 965mb with an extremely tight pressure gradient in the 100 miles around the low; 980 millibars just 50 miles out. It’s going to be a historic storm up around where it makes landfall. 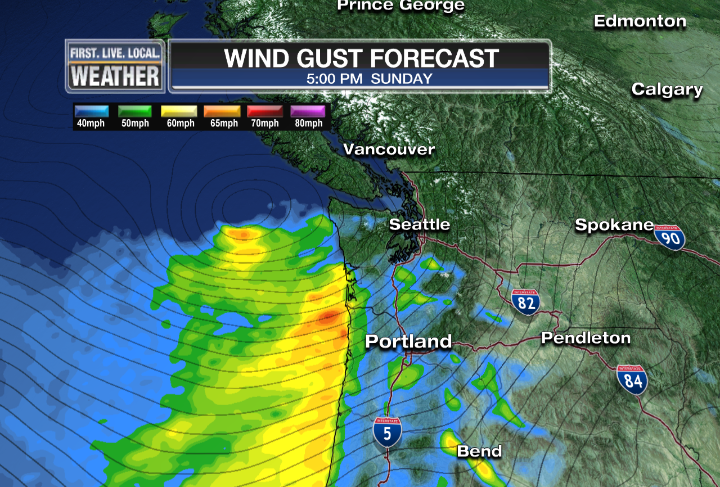 Lucky for us, the low is far enough away that it’s not in the “big windstorm” position. That said, once again with leaves on the trees and good mixing due to the warm temps, it shouldn’t be tough to get more damage than yesterday. Nothing of interest going on weatherwise after tonight, just cool showers. That was the line that briefly gave all of us a tremendous downpour between 5-7pm. As the cold front passed, winds turned much lighter and switched direction a bit more to the southwest than south. The peak windspeeds turned out almost exactly as expected, with 60-70 mph gusts (even a few higher) at the Coast and 35-45 mph gusts here in the metro area. PDX officially ended up with a 43 mph gust around 2:15pm and again with the cold front passage during the 6 O’Clock hour. 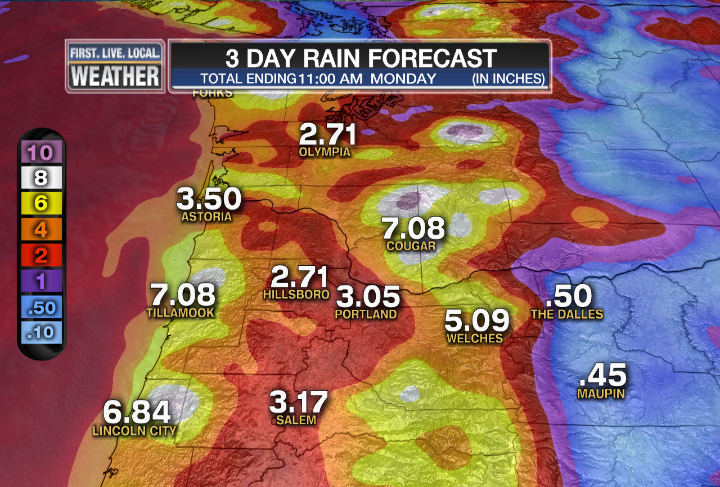 Still plenty of rain to go this evening and that’ll give us some localized flooding the next few hours! But that will taper off after 10pm as well. 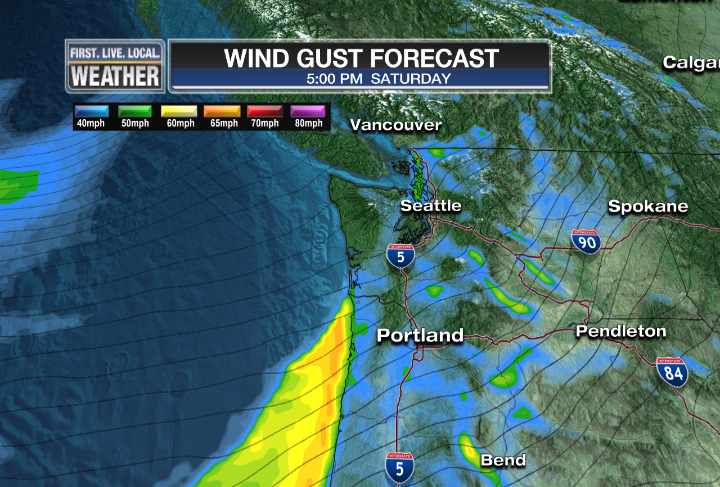 Strong wind at two different times…Saturday afternoon/evening and again Sunday afternoon/evening. Peak gusts at either time 55-70 mph at the Coast and 40-45 mph here in the valleys. The reason this is all such a big deal, and worthy of extra news coverage, is that it’s quite “out of season”. Typically we would see a few storms like this starting in November, but I’ve never see this action at the end of September. Very strange and worthy of a little news/weather hype? Yes. But not worthy of you getting worked up about Stormaggedon ’13. Otherwise enjoy the rain and wind from inside the next couple of days…time to catch up on reading and Netflix! And the wind forecast from our RPM model, showing a surface area of low pressure making landfall on Vancouver Island Sunday afternoon…it appears wind here and at the Coast will be stronger with this 2nd system. Over the past 18 hours models have been sending the low a bit farther north and deepening it a bit more. This will probably keep us from getting a “big windstorm” here in the valleys. Still, so impressive for late September! 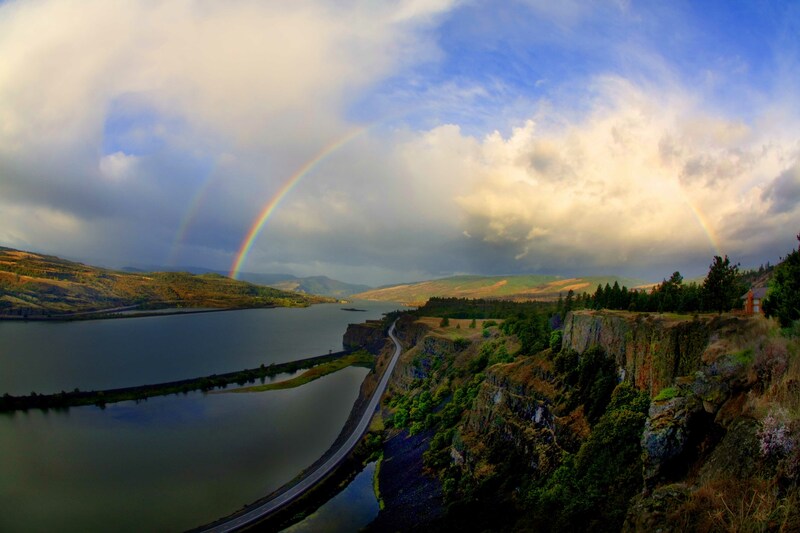 You are currently browsing the FOX 12 Weather Blog blog archives for September, 2013.